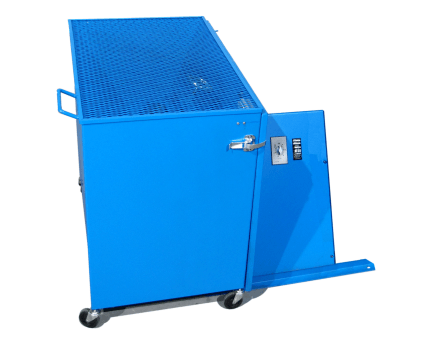 Enclosures for Morse Can Tumblers have a safety interlock to automatically shut off the drum rotator when the gate is opened. 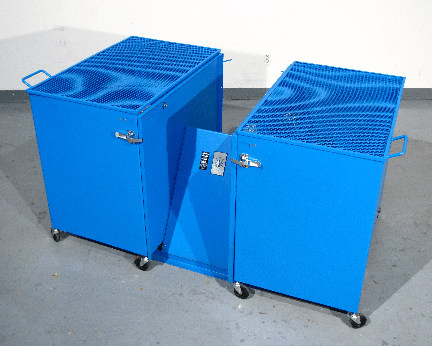 Order Guard Enclosure Kit for you to field install on your Can Tumbler. 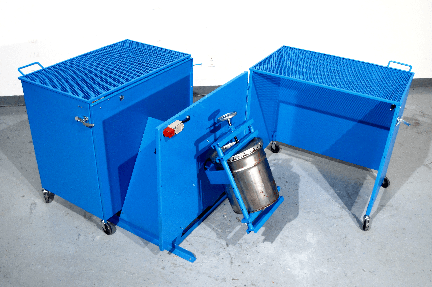 Order Guard Enclosure Option factory installed on a new Can Tumbler. can tumbler automatically shuts off. Guard Enclosure shown installed with Single Can Tumbler (Can Tumbler sold separately). GEK-2-305-1 2-305-1 AC 250 Lb. (114 kg) 2 Pieces: L42" W42" H42"
GEK-2-305-1-50 2-305-1-50 AC 250 Lb. (114 kg) 2 Pieces: L42" W42" H42"
GEK-2-305-1-230 2-305-1-230 AC 250 Lb. (114 kg) 2 Pieces: L42" W42" H42"
GEK-2-305-3 2-305-3 AC 250 Lb. (114 kg) 2 Pieces: L42" W42" H42"
GEK-2-305-3-50 2-305-3-50 AC 250 Lb. (114 kg) 2 Pieces: L42" W42" H42"
GEK-2-305-575 2-305-575 AC 250 Lb. (114 kg) 2 Pieces: L42" W42" H42"
GEK-2-305-A 2-305-A Air Switch 250 Lb. (114 kg) 2 Pieces: L42" W42" H42"
GEK-2-305-E1 2-305-E1 AC Explosion proof * 250 Lb. (114 kg) 2 Pieces: L42" W42" H42"
GEK-2-305-E1-50 2-305-E1-50 AC Explosion proof * 250 Lb. (114 kg) 2 Pieces: L42" W42" H42"
GEK-2-305-E3 2-305-E3 AC Explosion proof * 250 Lb. (114 kg) 2 Pieces: L42" W42" H42"
GEK-2-305-E3-50 2-305-E3-50 AC Explosion proof * 250 Lb. (114 kg) 2 Pieces: L42" W42" H42"
GEK-2-305-E575 2-305-E575 AC Explosion proof * 250 Lb. (114 kg) 2 Pieces: L42" W42" H42"
GEK-1-305-1 1-305-1 AC 125 Lb. (57 kg) L42" W42" H42"
GEK-1-305-1-50 1-305-1-50 AC 125 Lb. (57 kg) L42" W42" H42"
GEK-1-305-1-230 1-305-1-230 AC 125 Lb. (57 kg) L42" W42" H42"
GEK-1-305-3 1-305-3 AC 125 Lb. (57 kg) L42" W42" H42"
GEK-1-305-3-50 1-305-3-50 AC 125 Lb. (57 kg) L42" W42" H42"
GEK-1-305-575 1-305-575 AC 125 Lb. (57 kg) L42" W42" H42"
GEK-1-305-A 1-305-A Air Switch 125 Lb. (57 kg) L42" W42" H42"
GEK-1-305-E1 1-305-E1 AC Explosion proof * 125 Lb. (57 kg) L42" W42" H42"
GEK-1-305-E1-50 1-305-E1-50 AC Explosion proof * 125 Lb. (57 kg) L42" W42" H42"
GEK-1-305-E3 1-305-E3 AC Explosion proof * 125 Lb. (57 kg) L42" W42" H42"
GEK-1-305-E3-50 1-305-E3-50 AC Explosion proof * 125 Lb. (57 kg) L42" W42" H42"
GEK-1-305-E575 1-305-E575 AC Explosion proof * 125 Lb. (57 kg) L42" W42" H42"
GEO-2-305-1 2-305-1 AC 600 Lb. (273 kg) L71" W43" H41"
GEO-2-305-1-50 2-305-1-50 AC 600 Lb. (273 kg) L71" W43" H41"
GEO-2-305-1-230 2-305-1-230 AC 600 Lb. (273 kg) L71" W43" H41"
GEO-2-305-3 2-305-3 AC 600 Lb. (273 kg) L71" W43" H41"
GEO-2-305-3-50 2-305-3-50 AC 600 Lb. (273 kg) L71" W43" H41"
GEO-2-305-575 2-305-575 AC 600 Lb. (273 kg) L71" W43" H41"
GEO-2-305-A 2-305-A Air Switch 600 Lb. (273 kg) L71" W43" H41"
GEO-2-305-E1 2-305-E1 AC Explosion proof * 600 Lb. (273 kg) L71" W43" H41"
GEO-2-305-E1-50 2-305-E1-50 AC Explosion proof * 600 Lb. (273 kg) L71" W43" H41"
GEO-2-305-E3 2-305-E3 AC Explosion proof * 600 Lb. (273 kg) L71" W43" H41"
GEO-2-305-E3-50 2-305-E3-50 AC Explosion proof * 600 Lb. (273 kg) L71" W43" H41"
GEO-2-305-E575 2-305-E575 AC Explosion proof * 600 Lb. (273 kg) L71" W43" H41"
GEO-1-305-1 1-305-1 AC 342 Lb. (155 kg) L53" W43" H41"
GEO-1-305-1-50 1-305-1-50 AC 342 Lb. (155 kg) L53" W43" H41"
GEO-1-305-1-230 1-305-1-230 AC 342 Lb. (155 kg) L53" W43" H41"
GEO-1-305-3 1-305-3 AC 342 Lb. (155 kg) L53" W43" H41"
GEO-1-305-3-50 1-305-3-50 AC 342 Lb. (155 kg) L53" W43" H41"
GEO-1-305-575 1-305-575 AC 342 Lb. (155 kg) L53" W43" H41"
GEO-1-305-A 1-305-A Air Switch 342 Lb. (155 kg) L53" W43" H41"
GEO-1-305-E1 1-305-E1 AC Explosion proof * 342 Lb. (155 kg) L53" W43" H41"
GEO-1-305-E1-50 1-305-E1-50 AC Explosion proof * 342 Lb. (155 kg) L53" W43" H41"
GEO-1-305-E3 1-305-E3 AC Explosion proof * 342 Lb. (155 kg) L53" W43" H41"
GEO-1-305-E3-50 1-305-E3-50 AC Explosion proof * 342 Lb. (155 kg) L53" W43" H41"
GEO-1-305-E575 1-305-E575 AC Explosion proof * 342 Lb. (155 kg) L53" W43" H41"
* Explosion Proof motors are rated for Class I Group D, and Class II Groups F and G.